Clarke’s 1866 Bourbon eh? ye olde bourbon straight from Kentucky, a name you can trust right? Well not quite you see Clarke’s 1866 is one of those made up names done for marketing purposes and frankly I don’t know why they bother, this is actually really nice whiskey and I do wish they would drop these names but I guess it works and what do I know? 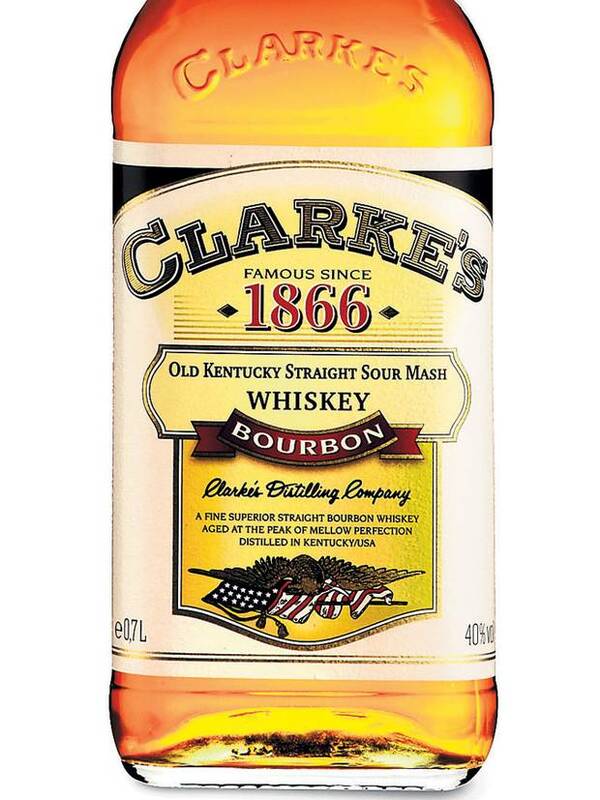 Clarke’s is actually pretty decent stuff but I’m no bourbon aficionado, I am however keen on the stuff, I love its sticky sweetness, I love that bourbon tang that just screams yee haw and doesn’t care what anyone thinks of it. On the nose well it’s Bourbon, sweet and sticky, a decent woody note and some aniseed coming through. It’s a young spirit, punchy but without being raw. Taste wise well it’s bourbon, my first thought was Jack Daniel’s which I like every now and again but this a Kentucky Bourbon so it can’t be that. It’s a young spirit at heart but there is no burn, very easy drinking, a little hint of all spice, aniseed again, a little bit of honey and a little burnt wood. Goes well with ice which again is a little indulgence of mine when it comes to my go to Bourbon which tends to be either Wild Turkey or Woodford Reserve, a little twist of orange peel and some bitters and it makes a rather nice old fashioned. Finish wise and I’m quite surprised, for a young spirit it lasts quite well, that aniseed flavour and a wood note lingers for a good while wee tiny touch of orange too. When I’m drinking a supermarket own brand I always try and figure out where it came from, Aldi and Tesco don’t have their own distilleries they are buying this stuff in and sticking their own label on it bottled at 40% and with added colouring so it looks authentic it’s one of the reasons a lot of supermarket whisky or whiskey in this case can get a bit samey as nice as much of it is. Every time I tasted this I got a combination of Wild Turkey and Jim Beam but perhaps a slightly younger version. Would I buy this? Aye, it’s a nice sipping Bourbon when you add a cube of ice or some bitters or even, and hear me out, pour a little maple syrup over the top, cracking little cocktail, now where are my cowboy boots and Willie Nelson cassettes? Once again thanks to Jessica at Aldi for the sample. I totally agree with this review. I actually like Clarke's more than Jim Beam. Great price for a supermarket whiskey. Jack Daniels will always be my favorite though. I think it’s lovely, nice and smooth not harsh on the mouth and goes down easily, too easily in fact, gives the bigger brands a run for their money. Never thought of drinking this with a bit of maple syrup. Will try it.